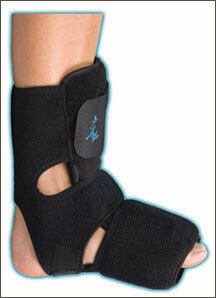 The painful symptoms of plantar fasciitis are often felt in the morning. Night splints can be used to keep the ankle at 90 degrees and to keep healing tissues stretched during sleep to decrease morning pain. With plastic components and padded lining, a night splint can superficially resemble an AFO, but it is not intended to be used when walking.